Changes to either of the settings in this panel will update the reverse checkboxes in the Main window's Receive and Transmit panels. Mark Offset an offset (in Hertz) that aligns the displayed RTTY receive frequency with a known mark frequency when operating in AFSK mode; negative values are accepted. This can be used to compensate for an offset between your transceiver's VFO display and its actual frequency. Mark Offset offsets (in Hertz) that align the displayed RTTY receive frequency with a known mark frequency when operating in FSK LSB mode or FSK USB mode; negative values are accepted. These can be used to compensate for an offset between your transceiver's VFO display and its actual frequency. If your transceiver's VFO displays the RTTY mark frequency, then the correct value for this setting is -2125. Configuring these settings is accomplished by clicking the MMTTY Setup button on the Configuration window's RTTY tab, which displays MMTTY's 6-tab Setup window; the settings adjustable via these tabs are fully described in the MMTTY help file; some frequently-used settings are also described here. However, tweaking this many settings while trying to work BQ9P through the auroral flutter is clearly impractical, so MMTTY provides a Profile mechanism. 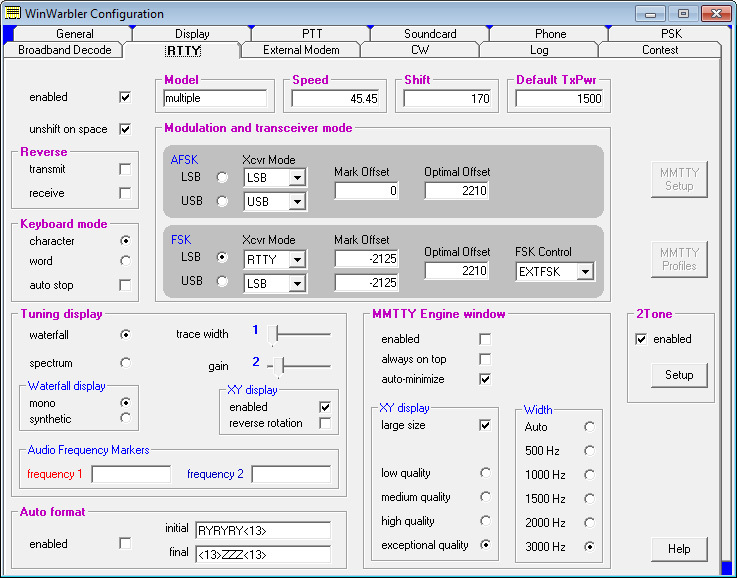 in which case MMTTY's settings will remain as they were during the last soundcard RTTY operating session. Profiles are stored in the file named USERPARA.INI that resides in your WinWarbler folder. To gain access to the above profiles, copy USERPARA.INI from the WinWarbler/Profile sub-folder to the WinWarbler folder before starting WinWarbler. Selecting a profile can change MMTTY's Unshift On Space, Reverse, and Keyboard Mode settings; you may need to modify these settings if they don't match your setup and/or preferences. Note that controls in the MMTTY Setup dialog allow you to enable or disable Automatic Frequency Control and the Bandpass Filter. WinWarbler's AFC and BPF control boxes will not reflect changes made via the MMTTY Setup dialog until you click the MMTTY Setup dialog's OK button. While the MMTTY Setup dialog provides control of settings otherwise not accessible from within WinWarbler, it also results in there being two different ways to specify some parameters, like the serial port used to control PTT. Making a change from either WinWarbler's Config window or MMTTY's Setup dialog will have the advertised effect, but its the WinWarbler settings that persist from one operating session to another. To specify your own sub-bands, make a copy of DefaultRTTYBands.txt in the Databases folder and name it RTTYBands.txt. Edit the frequencies in RTTYBands.txt as desired, and save your changes; you can also define sub-bands for the 6M and 2M bands. In the Main window's Mode panel, select a mode other than RTTY, and then select RTTY. the tuning display's frequency scale will be colored as specified by your custom sub-band definitions.